The iPhone is a hotbed for location-based social networks, which tap into the phone’s geolocation features to help users find nearby friends and strangers that they might like to meet. We’ve seen a handful of dating applications that cater to the straight community, and today brings the launch of Grindr (iTunes Link), one of the first iPhone applications geared towards gay and bisexual men. 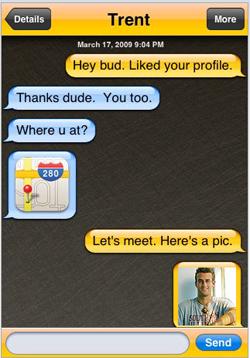 While privacy is an issue for all location based social networks, it is of the utmost importance on gay networks. Without proper security measures, bigots could easily download such applications and use them to pinpoint targets for hateful slurs and potentially even violence. Grindr deals with these issues by obscuring a user’s absolute location by default. Rather than plotting each user on the map. Grindr displays how far away they are (distances can range from a few feet to miles away). The application presents users with a list of nearby strangers, arranged in a grid of photos (you can click on a photo to see their personal profile). From here, users can strike up a real-time chat. If they decide they like their new acquaintance, they can they optionally choose to reveal their exact location. One of my concerns with new iPhone-based dating networks like Skout is they they have to face off with huge, well established players like Match.com, which are slowly releasing their own iPhone applications. Grindr’s Joel Simkhai says that there are a number of well established dating sites for gay men, but says that many of them feature adult content which Apple likely will be opposed to, giving Grindr a better shot. Other gay dating apps on the iPhone include The Gay Community App, which appears to have been hampered by a number of bugs that were recently fixed in an update.